Our Intermediate Carpet Moth Killer Kit provides you with everything you need to quickly and easily eliminate a carpet moth infestation affecting 2-3 rooms. The comprehensive range of carpet moth treatment products in all our Kits have been carefully selected to help you get rid of carpet moths fast and maintain long-lasting carpet moth control, stopping moths from causing further damage to your carpets and rugs! Supplied by market leaders Rentokil and Pest Expert and approved by the HSE for amateur use, the professional-standard carpet moth insecticides in our Kits are the most powerful carpet moth killers available to the DIY user and deliver outstanding results. Our Intermediate Kit offers double the quantity of carpet moth products found in our Standard Kit but at considerably less than double the cost. Includes a full two litres of carpet moth spray, allowing you to treat up to 50 sq m in a single application or a smaller area several times to achieve total carpet moth eradication. All our Carpet Moth Killer Kits come complete with step-by-step instructions on how to apply the carpet moth products, making treatment straightforward and hassle-free. 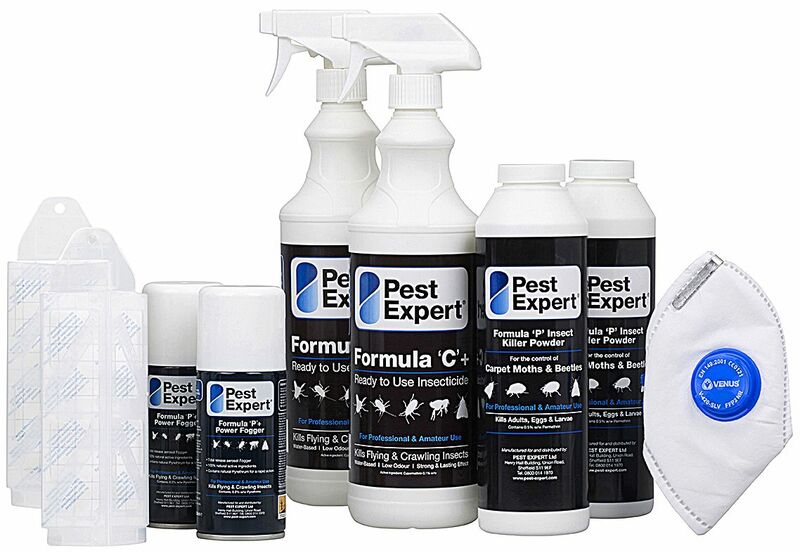 2 x Pest Expert Formula C Moth Killer Spray 1 Ltr: Formula ‘C’ is the strongest carpet moth killer on the amateur market, killing carpet moths on contact and leaving a protective residue that lasts for up to 12 weeks after application. This carpet moth spray is water based so can be used on any fabric or surface that will not be damaged by water. 2 x Pest Expert Formula 'P' Carpet Moth Killer Powder 300g: This carpet moth killer is effective against eggs, larvae and adult moths. Apply around the edge of the room for the best carpet moth control solution. Use in conjunction with the Formula ‘C’ spray for best results. 2 x Pest Expert Formula ‘P’ Foggers: This fumigator is a powerful aerosol designed to be an effective carpet moth killer and still be safe for home use. The insecticidal gas released expands to completely fill a room, penetrating even hard to reach areas where carpet moths may be lurking. Foggers, unlike smoke bombs, do not need to be lit so don’t present any fire risk. 2 x Demi Diamond Moth Pheromone Traps and Holders: Control carpet moths with these professional standard carpet moth traps. They have a pheromone lure that attracts the male moth only, trapping it inside. By trapping the males this prevents further reproduction, but for total eradication then use these in conjunction with the other products in the kit. Where carpet moth damage is more widespread or if you have a carpet moth infestation affecting multiple rooms, please see our Advanced Carpet Moth Kit in the Related Products below. Works perfectly. I followed everything exactly and haven't seen any since! Products all delivered exactly when I was told and are as described. Kept informed on progress of order. No reason to doubt how effective the products are, so far so good. Reviewed the web and identified MothKiller as offering similar products are a little less cost than others. Products seems to have worked well, although may need a follow up treatment, as advised. Prompt delivery allowing for instructions for leaving goods if not in. Instructions to use were easy to follow. Very prompt delivery arrived within stated delivery slot. Instructions were easy to follow and product has worked very well. Thank you. The product was delivered within 24 hours. Clear instructions and easy to use. Seems to have done the job as we haven't seen any moths for several days. The product arrived very promptly and I used it immediately . The instructions were clear and the treatment was effective . The delivery system was excellent enabling me to track delivery times. Instructions were easy to follow, except I hadn't realised there were 2 types of jet on the spray bottle. Safety gear is included which makes things so much easier. It's only been 3 days but so far no more signs of moths! Items arrived within 24 hours - brilliant service, highly recommended. Excellent delivery (next day) and product appears to be effective so far. Mothkiller.co.uk An excellent mother killing product. I was a bit concerned about the smell that would linger after using the product as this was done in a furniture showroom. However, I did not have to worry. No sign of anything lingered the day after the application was made. No sign of any moths either. The order was expedited efficiently and I was informed of the status of the order at all stages, from despatch to arrival and a follow up afterwards. Well done! Easy to order and a very fast delivery. Product was very easy to use and seems to be doing the job, would definitely recommend to other people. We were horrified to discover carpet moths in several rooms after moving home. This product was recommended to us and we'd certainly recommend it to others. It was quickly delivered and comes with clear and concise instructions. And, most importantly, we seem to now be clear of carpet moths! Carpet Moths Very prompt delivery, kit included everything necessary. Instructions could have been a bit clearer but simple enough to follow. Ample quantities supplied. Although it has only ben a week since applied I have not yet seen any further moths and none have appeared in the traps. They took time over the phone to answer my questions because i have cats and fish. the parcel was delivered the next day, just in process in using the moth killer kit. First class product. Next day delivery, no hassle, easy to use, good clear instructions. I ordered a range of moth killing products from this company. They kept me informed of the progress of my order and delivery every step of the way. The products arrived promptly and exactly as displayed online with clear instructions for use. I just hope they stop the damage caused by the moths. CARPET MOTHS WIPED OUT Having discovered patches of carpet moth damage in 2 rooms I bought a medium moth killer kit. Worked a treat, easy to apply and now moth free for several weeks! Excellent products and delivery was next day. Good service and information. Our carpet moth kit arrived by next day delivery and I found the directions easy to follow. The two rooms have now been treated and now we await to see if the moths are gone. No sign so far. Excellent products... Moth killer kit arrived promptly and well-packaged. Time will tell, but products appear to do the job. The fogger is particularly impressive! Would recommend. Followed the instruction and the carpets moths have gone just as quickly as they appeared. Few weeks on and no signs of them reappearing I have every confidence in this product and would recommend it to anyone who's carpet is being eaten away. Excellent service, arrived within 3 days and was just as ordered. Seemed to do an excellent job as the moths have now disappeared (I hope). Very prompt delivery many thanks for averting a problem. Great service lots of information on usage along with the products which arrived very quickly. Efficient The kit arrived promptly and was exactly as described on the website. The instructions were very easy to follow and we had no difficulty in treating the stairs and landing. Safety masks and gloves were provided. An excellent product! They informed me of the delivery day and an approximate time and there was my parcel, just as I said it would be. Just brilliant. The application of the products took some time and effort but since used we have not seen any sign of carpet mots, Used almost a month ago.Long may it last!! Very impressed with the super fast supply of products and professional assistance when contact made with company. The product supplied was extremely effective and fast acting. Having never heard of carpet moths before we panicked and searched for a solution - we could not have chosen a better product or company to come to our rescue! Great product, worked in one application. Not a sign of any moths or larva. Excellent service from Mothkiller. One of the bottles was punctured in transit, with loss of fluid. A phone call to Mothkiller and a replacement was in the post. I recommend Mothkiller and their products if you have a moth problem. Did the job, easier and better quality than I expected. Did the job, easier and better quality than I expected. The moth killer arrived very quickly after I ordered it. Appears to have done its job. Have not seen any of the carpet moths for a couple of days.! Will re treat if necessary . It was very good all you needed came in the kit and was well explained so far there have been no moths. 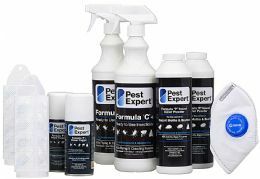 I liked having a range of products that allowed me to destroy all stages of the moth's life cycle and then monitor if there is any reoccurrence of the infestation. Five year sentence ended There are lots of good reviews for this site bu I was sceptical that the products would rid us of our moth blight. Telephone advice was clear, the order was delivered very quickly and email comms were frequent and accurate. did it do the trick then? Well I will reserve judgement until at least a month into our purge, but after five odd years of pointless swatting and splatting, we should have done this earlier. Products are easy to use although you need to set aside plenty of time and arrange to go out after you set the insecticide 'bomb' off. At this time of year we average about 10 per room if you glance around, and a scattering aroun the house. A week in and ive seen three overall. I suspect there were a few that were in a distant room (the kitchen, untreated as no soft furnishing). Now squished, ive seen no more. Here's hoping! So far so good! My moth killing kit arrived on time and I applied it to my carpet as per your instructions. Two weeks on and not a single moth or larvae detected. Fingers crossed that this continues! The kits seems to be very effective, the staff are a pleasure to deal with and the service is very reliable. Thank you for your help. I have recommended you to others in the same horrible situation. Very efficient service and products do what they say - KILL MOTHS!!! Product arrived promptly. Have applied moth treatment to my mother's carpet, but too early at this stage to know if it has worked. Was pleased with the very clear instructions as to how to apply and was simpler than I had expected. Job done in 1 day! Great service, swift delivery - Purchasing from MothKiller.co.uk was a straightforward and easy transaction utilising Paypal. Would definitely buy from them again (but hope that I don't need to) and would recommend them to anyone with the same problem with the little critters! Service and response to order was excellent. I would recommend your products to anyone. Did what it said on the tins! I was horrified to find an outbreak of carpet moths in my downstairs loo. I read up on several sites, before I settled on Moth Killer, which gave comprehensive info, everything I needed in the kit and at a reasonable price. All you need to beat the dreaded moths I bought one of the Intermediate kits after discovering a carpet moth invasion in a couple of rooms. The website was very comprehensive and thorough in helping me decide what I needed and the instructions that came with the kit were pretty fool proof. I'm keeping my fingers crossed that this has worked - two weeks and so far, so good. They took time over the phone to answer my questions becouse i have cats and fish. the parcel was delivered the next day, just in process in using the moth killer kit. Carpet moth eradication. Excellent delivery (next day) and product appears to be effective so far. Clear Easy to follow Instructions complete with Protection Safe Kit. As there is an increase risk of pest or moth infestations there is still a great deal of ignorance the life cycle of various pest infestations. What to do, what works, what is safe. 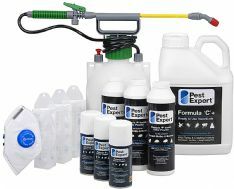 Well here is the perfect box of pest removal tricks. What is more important to remember is that pests and moths do return so knowing where to purchase further pest infection control reduces the concerns about future pest infections. One can bring in experts to do the job for you or you can learn your self and be ready and prepared for any future concerns. As a small business, my cleaners come in read the instructions and used the protective clothing. We all had a Moth infection discussion and we all agreed simple clear easy to follow the instructions and above all I would return back to use more Mothkiller.co.uk products. Excellent Service. Easy to order and a very fast delivery. Product was easy to use and seems to be doing the job, would definitely recommend to other people. Does what it says it does! We were horrified to discover carpet moths in several rooms after moving home. This product was recommended to us and we'd certainly recommend it to others. It was quickly delivered and it comes with clear and concise instructions. And, most importantly, we seem to now be clear of carpet moths! Excellent. They took time over the 'phone to answer my questions because I have cats and fish. The parcel was delivered the next day, just in process of using the moth killer kit. Wonderful products ..... my home is now moth free!! It was a simple process to order the products on line. The parcel arrived next day. I followed the instructions carefully and thoroughly and not a moth have I seen since!!! Brilliant products! Effective treatment at a fair price! This product was very effective in eradicating a nasty infestation of carpet moths. I would recommend this treatment to anyone in the same situation!